Federal Reserve Chariman Ben Bernanke announced yesterday, during another round of a previously unprecedented press conference, that the Federal Reserve Board Members and Federal Reserve Bank Presidents have revised their economic growth forecasts for the balance of 2011 and for 2012 and 2013 as well. To be specific, the Federal Reserve cut their forecasts for Gross Domestic Product (GDP), an often-used measure of growth in the U.S. economy, to a range of 2.7%-2.9% from a range of 3.1%-3.3% (which interestingly was also revised down from a range of 3.4%-3.9% as recently as April of 2011). Further, GDP growth forecasts were lowered to a range of 3.3%-3.7% from a range of 3.5%-4.2% in 2012 and to a range of 3.5%-4.2% from a range of 3.5%-4.3% in 2013. The Federal Reserve also adjusted their forecasts for unemployment and inflation, with both forecasts adjusted upward for the balance of 2011 as well as for the calendar years of 2012 and 2013. Source: Federal Reserve. 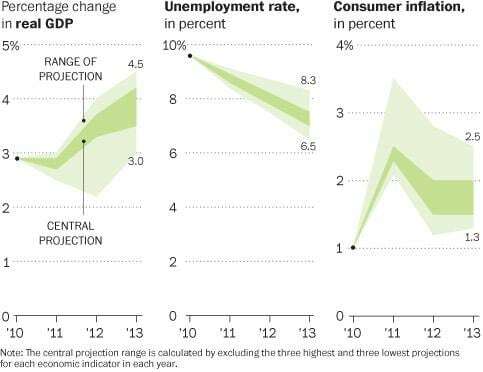 The Washington Post, “Federal Reserve, acknowledging slowdown, reins in forecast for economic growth” as published on June 22, 2011. We, at Hennion & Walsh, were not surprised by the revisions to the Federal Reserve forecasts as they reiterate the numerous headwinds that currently face the stalling U.S. economic recovery. Such headwinds can be found in the jobs, housing and commodities markets. While Chairman Bernanke indicated that “temporary factors are in part the reason for the slowdown”, we can only hope that the effects of the cited headwinds are temporary as these headwinds place further stress on already strained U.S. consumers whose spending patterns are a critical component of a robust and sustainable U.S. economic recovery. Remember that consumer spending currently accounts for approximately 70% of our nation’s GDP. Hence, consumer spending and economic growth are highly correlated and when Americans are uncertain about their household finances and start to rein in their own spending, the U.S. economy, in turn, generally does not grow as much as the following chart helps to illustrate. Source: Bureau of Economic Analysis. 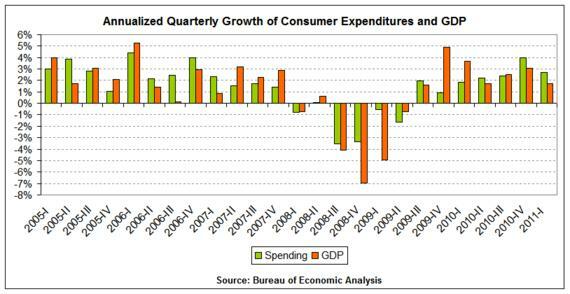 The Atlantic,” Chart of the Day: How Slower Consumer Spending Stifles GDP” as published on April 28, 2011. While we do not believe, based upon the economic data currently available, that the economy is at risk of slipping into a double-dip recession, we do believe that this economic recovery may be a longer, more drawn-out recovery than many, including the Federal Reserve, initially anticipated.